When I worked at Apple, my boss's boss was discussing UI/UX design with Steve Jobs in meeting about the Apple Online Store. Steve commented that contextual menus had become the "dumping ground" for the lazy designer. After upgrading to OS X 10.8.2, last night, I noticed two things. They weren't new things, but they jumped out at me. First was that Mac OS X is no longer Mac OS X, it's now just OS X. I had heard something about this rebranding earlier this year, but this was the first time that I actually noticed it. In 2001, when I spoke at WWDC, it was beaten into us that we had to refer to it as Mac OS X. The second thing - and this one's minor - is that the order of items on Mail's contextual menus could be better arranged - much better arranged. 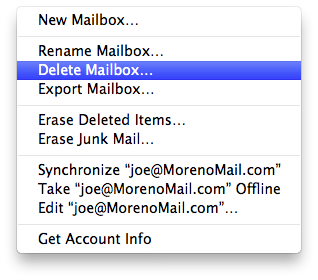 Specifically, when right clicking on an e-mail account the Erase Deleted Items/Junk Mail should be near the very top. In other words, they should be one of the first choices since they're the most common options selected. Personally, I think the New/Rename/Delete/Export Mailbox options probably don't even belong in this contextual menu since they're so rarely needed. But, that's just my 2¢. There may be a good reason that I'm overlooking. This past weekend, I flew down to Norfolk, VA. I was surprised that it was actually cool when I left Morristown, NJ but the forecast called for highs around 90° F so I knew that it would be warming up. I had never flown into Norfolk International Airport and I hadn't printed out a hard copy of the approach procedures or taxi diagram since that information was on my iPad. It was very pleasant at my cruising altitude of 6,000'. But, I could feel the heat and humidity when ATC stepped me down to 3,000' as I approached my destination. I realized that it would be an uncomfortable ten minutes, once I landed, until I reached my tie down spot and opened the door. Most small planes don't have air conditioners – it's all about the weight – so the only air movement inside the plane happens when it's flying. As I touched down, the tower told me to expedite a turn onto the taxiway because there was a jet on short-final approach behind me. I had already brought up the taxi diagram on my iPad so I knew exactly where I was and where I needed to go. 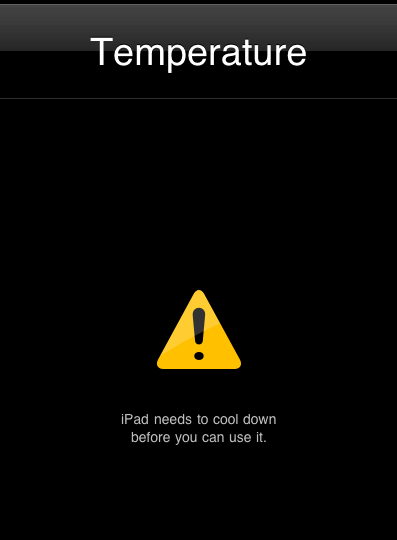 Then, within 30 seconds of landing, the iPad display went black and it shutdown. It had overheated. Obviously, this isn't an emergency situation but my heart did skip a beat as I evaluated my options before ground control told me to move. I figured, worst case, I could inform ground control that I needed progressive taxi instructions to the terminal, but that would be hard on my ego. After all, I didn't want to seem unprepared. Luckily, I remembered that I also had the taxi diagram on my iPhone. The electronic taxi diagrams are very handy since they not only display the layout of the airport's runways and taxiways, but they also mark your exact location, via GPS, within a couple meters. 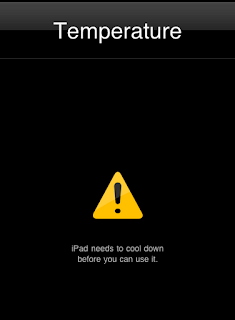 As I brought up the taxi diagram on my iPhone, I wondered if it, too, would shutdown due to the heat. Luckily, it didn't, but this is a scenario I will be better prepared for, next time.